SEO is an essential part of your website's online marketing campaign. Seo is all about getting your site as high as possible in the search engines result pages (SERPs) of major search engines, for keywords related to your business. The most important element of search engine optimisation is choosing the right keywords for your business - it’s not important what you think people are looking for, you need to know what people are really searching for. We provide thorough competitor research using tools such as Advance Web Rankings so that you can see who you main competition is and what they are currently doing. Our SEO service begins by identifying the right keywords to target and choosing terms that produce enough traffic to grow your business but are not so generic that the site will be lost amongst the competition. Once the most appropriate keywords have been identified, we will then build these keywords into the important areas of the site code and page text so that the search engines will be able to see them. Once the site has been launched with the keywords in place, it is essential to have an ongoing monthly management plan to maintain and grow the traffic driven to the site. This monthly programme aims to grow and develop links to your website by creating content which is of interest to potential customers and keeping the site content up to date. Clear, articulate and efficient copywriting helps clarify how your website targets and communicates with visitors. Each page of your website needs engaging, factual and interesting web content that will influence both your visitors and the search engines - resulting in more website traffic, higher rankings of your web pages in the search engine results pages (SERPs) and higher conversion rates. We provide thorough competitor research so that you can see who you main competition is and what they are currently doing. This is one of the key foundations of successful marketing. Search engines love links. Links are great in pointing the search engine spiders to visit your website frequently. However, one thing to keep in mind is that the quality of links is far more important than the quantity of links to your website. A number of one-way links from popular, well respected and established websites will increase the value of your website exponentially. We are committed to a continuous programme of link building and analysis in order to retain and improve your website position on the search engine results page. This includes link building and link analysis as part of our search engine optimisation set up and monthly management programme. All websites that we work with will have Google Analytics installed which is an excellent performance monitoring tool allowing you to measure not only the number of visitors to your site but also where they have come from, which pages they are visiting and which keywords they have typed into the search engine to click onto your site. 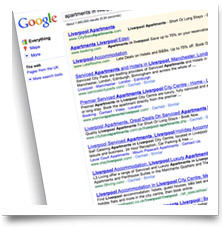 ..on how search engine optimisation can help you make the most of your website, please contact Creative Heights.